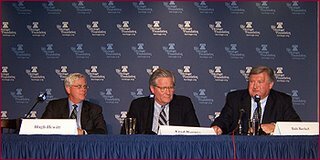 Here is a picture I managed to take at the Heritage foundation panel discussion on Hugh's new book. I haven't read the book yet, but I thought I would share some of my notes on what was said. "We are an opposition party. We are against Bush." Beckel disagrees with Hugh on the impact of hte blogosphere, but my co-worker and I where discussing that even if Beckel is right in that most undecided voters are not influenced by the blogs directly, the influencers are. If the Democrat party is on the same page as Beckel, this is good news for the GOP, who seems to be paying more attention to bloggers. Fred Barnes said everyone who has been to Iraq has told him "We are winning the war; the media is wrong." He also agreed with Hugh on the issue of judges saying, "Bush ought to take up the issue of judges again." He pointed to 17 nominated judges that are just sitting there. He reacted to the new Democratic strategy. "They are for catching Osama Bin Laden; Bet no one had thought of that!" Bob Beckel makes the argument that the "party" is becoming less and less important, and that ideology is what matters more. He got into critizising the Republican party for becoming what he called "moral interventionist." While he might be right that the GOP needs to be carefull about not granting government more and more powers for the sake of "good moral causes," he still misses it in regards to the Democrats phobia against Christianity. Hugh Hewitt took the opportunity to talk about the issue of illegal immigration, saying he believes most Americans are not as concerned about the current millions of illegal immigrants, as much as that they are concerned about the next 11 million. He calls the border fence "a symbol of resolve" to protect our country. It resonated with my previous post about securing our borders FIRST before we try to address the current illegal immigrants in our country. I just got my hands on a copy of Hugh's new book, Painting the Map Red. I'll try to read through it as quickly as I can and provide a book review here. Look for it. I heard him today at the Heritage Foundation, and it was great. The panel discussion was lively, and Hugh had some good points to make. I don't always agree with him on everything, so I am looking forward to seeing what he has to offer for 2006 strategy. Feel free to comment about anything related to 06 and 08 elections here. A semi-open discussion thread, if you will.